We don’t have to travel far from the big toe to get to my #3 most underestimated injury, the ankle sprain. Maybe ankle sprains aren’t the most painful condition of the three, but when not rehabbed properly or just “walked off” the future ramifications can be devastating. The most commonly sprained ligament ( remember that ligaments get sprained, while tendons/muscles are strained) in the ankle is the ATFL. This is usually done by suffering an inversion sprain. Once this tissue as well as the mechano-or proprioceptors in the lower leg have been damaged, your brain’s knowledge of where the ankle is in relation to your leg and the floor becomes altered. This poor proprioception leads to decreased balance and decreased motor control of the leg. Also there is research that supports the argument that many people who have recently sprained an ankle have a delayed muscle response in the glutes, meaning there may be other motor control deficits within the hips and lumbar spine. The changes that occur at the ankle and above cause an increase in likelihood that you will suffer another ankle injury, or even knee or hip injuries. Grade One -the most common type of ankle sprain, in which there is a quick turn of the ankle with fleeting pain. This unfortunately is enough of a force to alter the proprioception of the ankle leading to increased risk or more severe ankle sprains. Grade Two – Obviously more severe than grade ones, with a wide range of damage that can occur at the ligaments (5-95% torn). 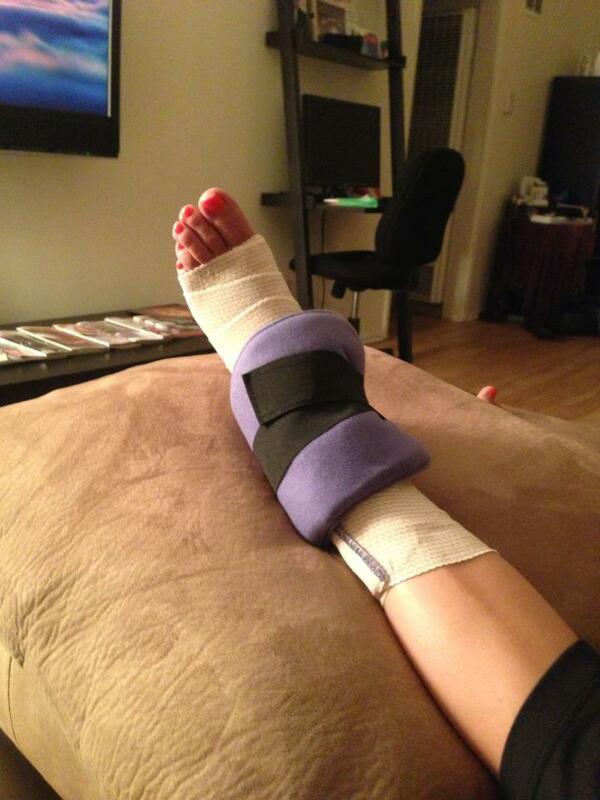 These sprains will usually knock players out of games, or others out of work for a few days. These are typically treated with physical therapy, unless an MD deems a worse grade two ankle sprain operable. Grade Three – These sprains range from 95% torn to completely torn and typically need surgical repair (Brostrom procedure) followed by extensive physical therapy. My problem with ankle sprains is people’s insistence that “it’s just an ankle sprain” and send their athletes back into games or return them to play too early. Also, weekend warriors just sorta wait it out until it doesn’t hurt anymore. These people don’t consider that even though there may not be pain, there are changes to the way they move or to their balance and proprioception and they may be at risk for re-injury or worse injuries. So I just suffered an ankle sprain; what should I do? Heat – Helps lymphatic vessels stay open so inflammation can be cleared away – Contrary to popular belief it is the lymphatic vessels that clear swelling, not the veins. Movement – As just stated, lymph only work with mechanical pumping provided by muscle contractions, therefore even if an injured tissue hurts too much to move it, you can often move the tissue below it (toes in this case) or above it (knee, hip) to use the muscle pump provided by these areas. Once I deem ankle tissues healthy enough to bear weight and the inflammatory stage has ended (anywhere between 10-14 days) I start with a static balance program ( for the 2 week to 4-6 week time frame) to re-establish balance and proprioception of the lower extremity, not just the ankle. I then safely progress to more dynamic balance regimen at the end this 4-6 week time span. Whoa, whoa, whoa. 6 weeks? I know it sounds crazy and long and I must be stupid, but when the re-inury rate of lateral ankle sprains in 80% there must be something wrong with the previous way of doing things. How come an MCL sprain has a wide range of time that can be missed from recreational and athletic activities, but an ankle sprain only deserves one week max? Typical tissue healing occurs at around the 6 week mark if EVERYTHING has gone well, and usually it doesn’t. This is why I’m looking at the 6 week mark. As I say in my previous article about ankle sprains and returning to play, I’m also concerned with whether or not a person can complete tasks that are required of them in their athletic/recreational/occupational activities. I highly suggest you give my “When can I play” article a read for even more of my requirements and progressions for patients who have suffered ankle sprains. It’s time we progress past the old-thyme rehab of ankle sprains that leads to constant re-injuries. Ankle sprains need to start being taken seriously, and for this reason I am saying that they are my #3 most underestimated injury.